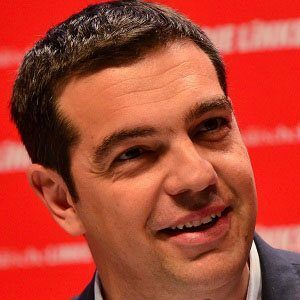 In early 2015, this Syriza Party politician took office as Prime Minister of Greece. Previously, he had served as the Hellenic Parliament's Leader of the Opposition. In his teens, he became a member of the Communist Youth of Greece. Later, after earning a degree in civil engineering from the National Technical University of Athens, he became a national secretary of the youth branch of the Synaspismos (a leftist political coalition) and went on to become the youngest-ever leader of the organization's main body. He stirred controversy by openly criticizing the Greek Orthodox Church and by refusing to swear on the Bible at the time of his inauguration as Prime Minister of Greece. With his domestic partner, engineer Peristera Batziana, he raised two sons, one of whom was named for Marxist revolutionary Ernesto "Che" Guevara. Tsipras succeeded New Democracy Party politician Antonis Samaras as Prime Minister of Greece.